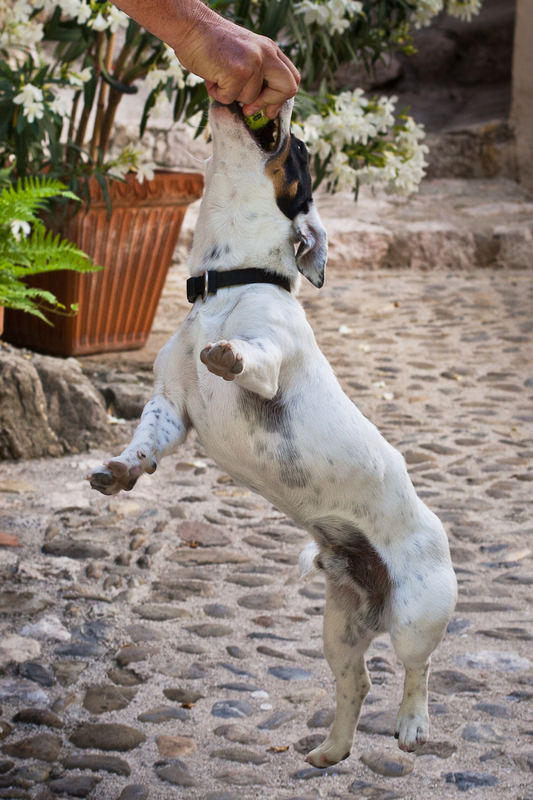 This is Pippo, a high-energy one year old Jack Russell who lives in Italy. I met him walking through the medieval village of Gorbio where he wouldn't let go of his tennis ball and that is what he is doing here - clinging on to the ball, feet off the ground. Ideally, I'd have used a different setting on the camera so the background was more blurred but it wouldn't deal with the speed of this little dog. Perhaps I'll meet him again one day, with his charming owners, Mauro and Dimitri - then we'll settle him down and have another go at a portrait. But then how often is a Jack Russell calm and quiet?! I love those dogs, they are so cute! Great shot! i suspect this is the portrait that truly captures his personality. Love the energy in this photo!